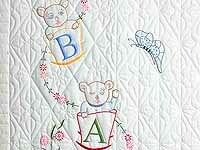 Cute collection of embroidered bear cubs and a butterfly! Excellent embroidery and lots of fine quilting. Note the attractive yellow border print. Includes a sleeve for a hanging rod. Made by local Amish woman. 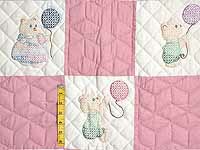 Cute collection of embroidered bear cubs with ballons Excellent embroidery and lots of fine quilting. Note the attractive border print. Includes a sleeve for a hanging rod. Embroidery done by disabled Amish girls in a sheltered workshop, quilting was done by one of their mothers. A charming collection of barnyard (and more) animals . Look at the wonderful embroidery and fanciful designs. Be sure to note the charming border print. Made here in Lancaster by Amish woman. Includes a sleeve for a hanging rod. 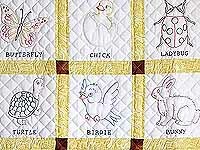 Charming embroidered crib quilt lovingly made by a disabled Amish girl. Excellent stitching. 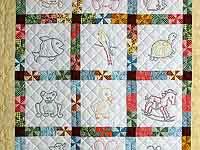 A wonderful quilt for that special baby! Includes a sleeve for a hanging rod.